Many of us are old enough to remember the days of tanning oil and sun reflectors. Sun protection as a concept didn’t exist back then. I fondly recall the days of my childhood walking around Brighton Beach in Brooklyn, with no shirt all summer with a clear-cut tan line. Well those days are gone along with the dangerous world without bicycle helmets and seat belts. We now know that tan skin is damaged skin no matter how healthy and youthful you look. The American Academy of Pediatrics now recommends lifelong sun protection starting at an early age. Wear hats, they aren’t just for the winter! Baseball caps are popular but the ears are like a UV light absorbing antenna, make sure you apply sun block to your child’s ears if they are wearing a baseball cap. Sunglasses block UV rays, but staring in the sun is still dangerous, for both you and your children. Don’t forget to apply to the nose, ears and top of the feet as these are the most commonly forgotten places. There is no reason you and your child shouldn’t enjoy the summer sun and outdoor activities. You only need to follow these protective measures, including bringing and applying plenty of sun block as it washes off with sweat and saltwater. 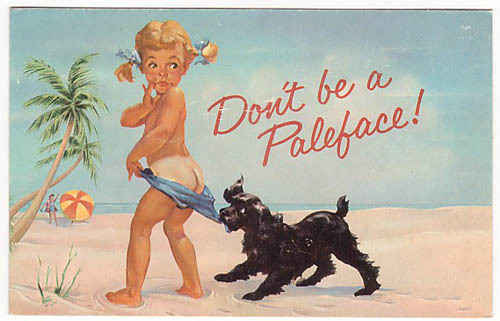 So it turns out that Coppertone ad was wrong… A Pale Face may not be a bad thing ! This content is subject to change as new health information becomes available. The information is intended to inform and educate and is not a replacement for medical evaluation, advice, diagnosis or treatment by a healthcare professional.